Ted tests out Salomon’s new Shadowfit technology on the District. Think of it as taking everything you loved about Relay and making it work even better. Is it for everyone? Did Ted like it? Read the review to find out more. 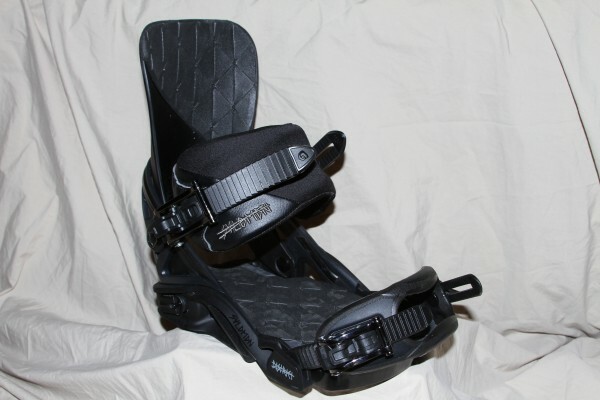 Binding Adjustability: Tool-less toe ramps, heel straps, toe straps, and two forward lean adjustment screws on the sides. Straps: Overall a fairly loose binding. Although the heel straps were tight enough for me to enjoy the day, I couldn’t shake the feeling that they just weren’t tight enough for my style of riding. I had the heel straps at the tightest setting, and I still wanted to keep cranking down to no avail. The toe caps are too big. They are the same design as the Salomon Cypher binding, which has a similar issue. Highbacks: Salomon went with a larger more tapered (almost winged) approach on this one. I believe the intent is for the highback to have a looser feel while still providing peripheral support. I think I prefer the shorter highbacks on the Salomon Rhythm and Cypher bindings. Binding Flex: This binding is pretty soft compared to other Salomon bindings. Maybe that’s because I couldn’t get the heel pad as tight as I would have liked. Ratchets: The ratchets work perfectly fine. It is easy to get into and out of this binding. I’m not sure I’m the biggest fan of the strap length adjuster, however. You don’t know that the adjustment screw comes off, making it easy to lose the first time you adjust the length of the heel pad or toe strap. Rider in Mind: Easy stylin’ medium to advanced park rider who most likely prefers rails over jumps. Personal Thoughts: I’ve gotta say I’m not the biggest fan of these bindings. While I was able to ride perfectly fine with them, I thought they were too loose for my style. I really like to crank down on the heel and toe straps, assuming they’ll loosen a little during my run. When I wasn’t able to do this, I was somewhat saddened (and then stoked because I was hitting Park Lane in spring).